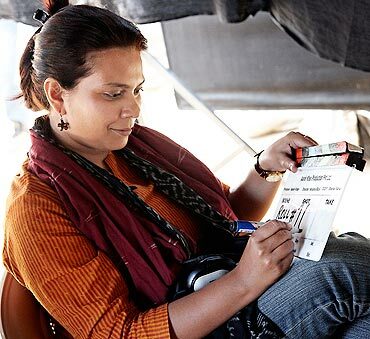 There is a story about the making of director Anusha Rizvi's Peepli Live and it sounds hard to believe. According to the story, Rizvi was looking for funding for the film. 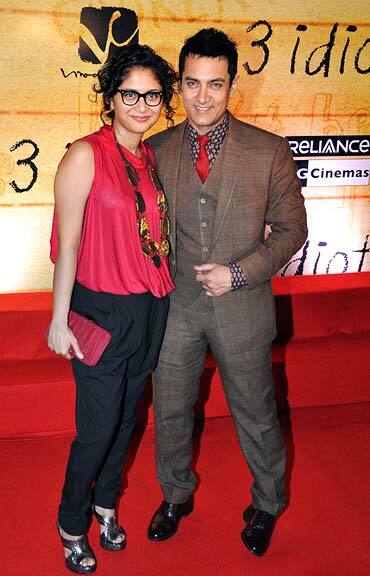 She somehow managed to get Aamir Khan's email and wrote to the star. The subject line of the email was "The Falling" -- Rizvi's first choice of title for the film. Khan received the email while he was on the set of The Rising: Ballad of Mangal Pandey and he opened the email because of the subject line. He thought someone was playing a joke on him. "It is true," Khan said recently as he visited New York City to promote his home production -- Peepli Live. "When I read the email I thought someone was being cheeky with me. So I didn't take it seriously. But she kept writing to me and told me that she was a journalist from NDTV. So that's when I started to take her a little bit more seriously." Later when Khan was in New Delhi for the Rang De Basanti shoot, he called Rizvi (who is based in India's capital city) for a script narration meeting. "I really loved it," Khan said. "I thought it was really funny, fast pace, thought provoking and heart breaking." Download Peepli Live ringtones, wallpapers & more! Peepli Live -- Rizvi's first feature based on a crackling and hilarious script she co-wrote with her husband Mahmood Farooqi, is a political satire that covers the important issue of farmers' suicides in India. But the film also pokes fun at the expense of the media as well as the political powers in India. The film stars Raghubir Yadav and also Naseeruddin Shah in a small role. Most other actors in the films are newcomers, some who are from the world of theatre. Khan does not act in the film. Khan arrived in New York accompanied by his two dark suited bodyguards, who sat outside the conference room at the Four Seasons Hotel, where the star was meeting with the press. Also with him was his personal valet. If Khan was being photographed or videotaped, the valet would quickly produce a mirror for the star to dab some foundation on his face and fix his hair. Peepli Live is Khan's fourth production, after Lagaan, Jaane Tu Ya Jaane Na and Taare Zameen Par. Peepli Live opens in India and US on August 13 and Khan has been seriously promoting the film. 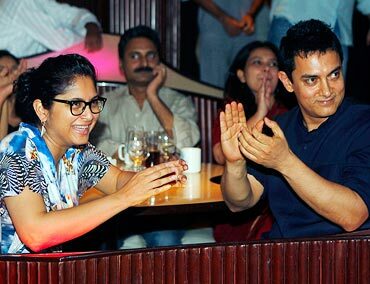 The film has already garnered a lot of attention in India, but more so because it is an Aamir Khan production. "Well it would be more difficult to market it and reach out to people, without a strong name attached to it," Khan said about Peepli Live, the first Indian film to enter into competition at the Sundance Film Festival. "This one is particularly tough, being an unusual film. It's got no stars and we also want to reach out to a non-traditional audience who has never perhaps seen an Indian film before. We are not a big studio. We are not Warner Bros or Sony Classics. So we are doing our best to reach out all across." In India his promotion efforts for Peepli Live have generated enough buzz. Originally Peepli Live was scheduled to open in 150 screens in India. But now there is interest in the A as well as the B markets in India and the film is scheduled to open in 500 screens. "What we are looking for is to reach out as deep as we can," Khan said. "As we are getting feedback, even single screens in smaller towns are contacting saying they want the film to play there". Khan has worked with first time filmmakers in the past -- Farhan Akhtar (Dil Chahta Hai), John Mathew (Sarfarosh) and Abbas Tyrewala (Jaane Tu...Ya Jaane Na). "It is important for me to see if the filmmaker is someone I can trust to execute what he's written or what's on paper," he said "I think the ability of the person is more important to me and what he or she has to say. Does the filmmaker have a story to tell and if yes then I think that excitement and energy comes out. It comes out in the narrative." Still this was a big decision for Khan. So he asked Rizvi to shoot a few scenes from the script. Rizvi shot those scenes and showed to Khan for his approval. Khan eventually green lit the project. "When I saw the first cut of the film, she had really lived up to the trust I had in her," he said. "I think she has made a marvelous film. It's a very unusual film for Indian cinema. It's very layered. It's got amazing characters and it's an ensemble piece." "It has a lot of chaos happening, because it is not easy to shoot, while film shoots are completely chaotic every day," Khan added. "But to actually create the chaos in front of the camera and make it look real is actually not easy. When I saw the film for the first time, I was amazed at how well she had captured that. It almost looks like that is really happening and looks like she has hidden the camera and captured the reality." Jaane Tu...Ya Janne Na was the first time Khan produced a film where he was not acting. This is the second case. In both the situations he defined his role of a producer as someone who provided the resources, and was involved in the final decisions such as casting. He dropped by a few times during the four weeks of pre-shoot rehearsal for Peepli Live, but did not go to the set. "I want the directors to be on their own to do what they think is right," he said. "I watch the dailies to see if everything is right. Right up to the first cut I stay away. I am more involved in giving the final shape to the film, along with the editor and the director. And of course releasing the film as well as I can." Peepli Live was shot the same time Khan was busy with his hit film 3 Idiots, so part of his focus was elsewhere. "I went to the set one day when they called me and asked 'so what does the producer look like?'" he said laughing. "So I went just to say hello to everyone." Peepli Live and Khan's next production Dhobi Ghat (directed by his wife Kiran Rao) are a departure from the more Bollywood productions he has been involved with. He says this evolution has happened organically. "What's common in these two films is that both have first time women directors and that's great to see," he says. "As a human being and as a creative person I am also constantly evolving. My taste is changing. " Early on in his career he learnt some harsh lessons and since then he has followed one goal: "I will never do a film, unless I am happy doing it. That one rule I've kept from 1992 until now." By happiness the 45 year old actor meant that he would only work with talented people who have similar sensitivities as him. "Of course you have to go with certain trust and faith," he said. "Sometimes you might discover that the film may have ended up somewhere else and what the team wanted to make they haven't been able to achieve. That happens. But the intention and effort are important to me and the attempt to do that makes me happy." He maintained that for long he worked on films that could not be categorized as typical mainstream films works including Andaz Apna Apna, Jo Jeeta Wohi Sikander, Sarfarosh and Earth. "I felt I was swimming against the tide, but now the tide seems to have been turning and it is going with me," he says. "That's great to see. I mean, what was once understood as mainstream is not true anymore. The audiences are changing, filmmakers are changing and younger minds are coming. Audiences are open to different ideas now." He considered Lagaan and Sarfarosh as turning points in his career in one way. "These films gave me a lot of strength to continue to do what I believed in and experiment more and push the envelope more. And that's what I've been doing all along." Khan has the reputation for being one of the most calculating figures in the Bollywood film industry -- carefully choosing projects and doing far few films, that keeps the audience intrigued about his life and his next moves. But he denied that there was any grand plot that he has developed to advance his career. "I don't think I can work any faster," he said laughing. "I know people don't believe and think I am not serious, but I am working all the time. The thing is that each film takes so much out of me and it's very important for me to be with my family and spend time with them. I need inputs before I can give outputs. So I am saying all of this put together I don't think I can work any faster. I have one film coming out a year that's not bad. That's a pretty good pace I think." "I feel happy that people are waiting for my films," he added. "It's very encouraging for me, emotionally very enriching to know and feel that. But the thing is that I am not doing this as a tactical move."